Half of U.S. adults living with chronic disease are e-patients. Looking at the population as a whole, 51% of American adults living with chronic disease have looked online for any of the health topics we ask about, such as information about a specific disease, a certain medical procedure, prescription or over-the-counter drugs, or health insurance. Lack of internet access, not lack of interest in the topic, is the primary reason for the gaps. In fact, statistical analysis finds that, once online, having a chronic disease has a positive effect on someone’s propensity to look online for health information. 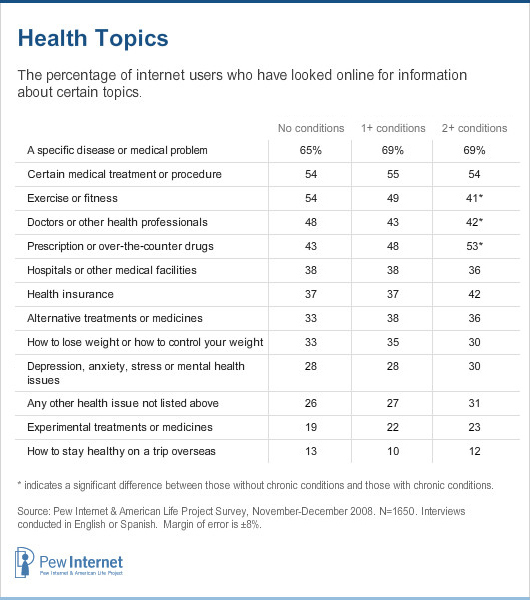 Education and type of access (broadband or wireless) are still the strongest predictors for seeking health information online but the more diseases an internet user reports, the more likely they are to seek advice online, independent of all other demographic factors. The motivations to go online for health information are probably as varied as the topics people research. People living with chronic disease are likely to be managing multiple conditions, filling multiple prescriptions, and visiting multiple doctors.19 In fact, a Harris Interactive study found that 17% of people living with chronic conditions reported receiving conflicting information from providers and 18% reported having duplicate tests or procedures performed.20 And again, the internet can be an information vending machine for some users and a powerful communications resource for others, depending on the nature of their illness or their level of interest in a certain topic. There is almost a universality of interest in the following health topics, no matter someone’s health status. Chronic disease increases someone’s propensity to look for information about many of these topics, though not all. In addition, information seeking for many of these topics is driven by key demographic factors such as being female, holding a college degree, having broadband at home. These influences are noted in the text below. Overall, 69% of internet users living with chronic disease report that they have looked online for information about a specific disease or medical problem, compared with 65% of internet users who report none of the chronic conditions named in the survey. This does not represent a significant difference between the two groups. However, among internet users, being female, having a college degree, or having home broadband access increases the likelihood to look for this type of information online. Chronic disease also slightly increases the probability that an internet user will look online for information about a specific disease or medical problem. 55% of internet users living with chronic disease report that they have looked online for information about a certain medical treatment or procedure, compared with 54% of internet users who report none of the chronic conditions named in the survey. Again, this does not represent a meaningful difference, but statistical analysis finds that being female, having a college degree, having home broadband access, or living with chronic disease all increase an internet user’s likelihood to look online for this type of information. 49% of internet users living with chronic disease report that they have looked online for information about exercise or fitness, compared with 54% of internet users who report none of the chronic conditions named in the survey. This gap represents a significant difference between the two groups. In addition, being young, non-white, female, or college-educated are each predictors for doing online research about this type of information. 48% of internet users living with chronic disease report that they have looked online for information about prescription or over-the-counter drugs, compared with 43% of internet users who report none of the chronic conditions named in the survey. This is the one topic which is significantly more popular among internet users living with chronic disease than among non-chronic internet users, which is in line with studies conducted by Manhattan Research.21 Statistical analysis shows that the presence of chronic disease has an independent effect on someone’s likelihood to seek information about drugs – the greater the number of diseases reported, the greater the interest in this type of information. In addition, a college degree, broadband, or being female are each associated with a propensity to do online research about prescription or over-the-counter drugs. 43% of internet users living with chronic disease report that they have looked online for information about doctors or other health professionals, compared with 48% of internet users who report none of the chronic conditions named in the survey. This represents a statistically significant difference between the two groups. In addition, among internet users, being female, having a college degree, or having home broadband access increases the likelihood to look online for information about doctors and other health professionals. 37% of internet users living with chronic disease report that they have looked online for information related to health insurance, including private insurance, Medicare or Medicaid, the same percentage as internet users who report none of the conditions named in the survey. Once again, being female, having a college degree, or having home broadband access increases an internet user’s likelihood to look online for information about health insurance. None of the respondents to the qualitative survey mentioned using the internet to get information about health insurance (it is likely that those living with chronic illness are in touch with their insurance providers on a fairly regular basis by telephone or mail, and are already deeply familiar with their plan and coverage). Nearly all of the responses who did mention health insurance expressed frustration, some using language that cannot be printed here. 38% of internet users living with chronic disease report that they have looked online for information about hospitals or other medical facilities, the same percentage as those who report none of the chronic conditions named in the survey. Statistical analysis shows that the presence of disease in someone’s life has an independent, positive effect on their likelihood to look online for this type of information. Being female, having a college degree, or having home broadband access increases an internet user’s likelihood to look online for this type of information. 38% of internet users living with chronic disease report that they have looked online for information about alternative treatments or medicines, compared with 33% of internet users who report none of the chronic conditions named in the survey. Statistical analysis shows that having wireless access is strongly associated with a propensity to look online for this type of information. Having a college degree, being female, or living with chronic disease are also associated, but to a lesser degree, with looking online for information about alternative treatments. 28% of internet users living with chronic disease report that they have looked online for information about depression, anxiety, stress or mental health issues, the same percentage as those who report none of the chronic conditions named in the survey. Statistical analysis shows that, among internet users, as the number of chronic diseases someone has increases, the more likely they are to seek information online about mental health issues, independent of other factors. Being young or being female are also associated a propensity to do this type of research online. 35% of internet users living with chronic disease report that they have looked online for information about how to lose weight or how to control their weight, compared with 33% of internet users who report none of the chronic conditions named in the survey. Being young, non-white, female, or college-educated are each predictors for doing online research about this type of information, as is having wireless internet access. Chronic illness is not correlated with seeking this type of information. 22% of internet users living with chronic disease report that they have looked online for information about experimental treatments or medicines, compared with 19% of internet users who report none of the chronic conditions named in the survey. Statistical analysis shows that as the number of chronic diseases someone has increases, the more likely they are to seek information online about experimental treatments, independent of other factors. 10% of internet users living with chronic disease report that they have looked online for information about how to stay healthy on a trip overseas (such as immunizations and shots), compared with 13% of internet users who report none of the chronic conditions named in the survey. Having a wireless connection, being non-white, or living in a lower-income household each increase an individual’s propensity to look online for this type of information. None of the respondents to the qualitative survey wrote about this health topic. 27% of internet users living with chronic disease report that they have looked online for information about any other health issue, not included in our list, compared with 26% of internet users who report none of the chronic conditions named in the survey. This question was included as a catch-all to be sure everyone who has done online health research is included in the analysis. The essays collected in the qualitative surveys are a window into the variety of health information sought online from home remedies to nutritional information to smoking cessation tips. Few are engaged daily or even weekly with online health resources. 81% of internet users living with chronic disease say they go online and do something related to health less often than once a week. 10% say they do so once a week. 5% say they do so every few days. Only 3% say they go online and do something related to health once a day or more. These findings match the habits of the general population of internet users: 81% of all internet users say they go online and do something related to health less often than once a week. It appears that online health research is generally conducted episodically, on a need-to-know basis. People living with chronic disease, much like everyone else, are busy working and socializing, hoping to avoid the need to investigate a new diagnosis or treatment. Frequency is not necessarily an indication – in either direction – for the quality of someone’s engagement with online health resources. Not surprisingly, e-patients living with one or more chronic diseases are often focused on their own concerns: 51% say their last online health inquiry centered on their own medical situation. Thirty-four percent say their last health search focused on someone else’s concerns. Eight percent volunteer that their last inquiry was on behalf of both themselves and someone else. By comparison, e-patients who report none of the chronic diseases recorded in this survey are likelier to say their last health search focused on someone else’s concerns. Thirty-seven percent say they were looking on behalf of themselves, 47% say they were looking on behalf of another person, and 10% volunteer that the last search was for both themselves and someone else. Statistical analysis bears out this observation. If someone is dealing with a chronic disease they are more likely than other e-patients to research their own questions, regardless of their age, education level, or other demographic variables. Health professionals dominate the information mix. More than any other group, people living with chronic disease remain strongly connected to offline sources of medical assistance and advice. 93% of adults living with chronic disease ask a health professional, such as a doctor. 60% ask a friend or family member. 56% use books or other printed reference material. 38% contact their insurance provider. 6% use another source not mentioned in the list. 83% of adults who say they have no chronic conditions ask a health professional, such as a doctor, when they need medical assistance or information. 64% ask a friend or family member. 52% use books or other printed reference material. 29% contact their insurance provider. 5% use another source not mentioned in the list. Statistical analysis shows that living with a chronic disease has a significant, independent effect on someone’s likelihood to stick with offline sources. In fact, although other factors, such as advanced age, are associated with a reliance on offline health resources, having a chronic disease is the strongest predictor of all the variables included in the analysis. Once they find health information online, most talk it over with friends and family. Most internet users, once they find health information online, usually talk with someone about it, regardless of their health status. Two-thirds of e-patients living with chronic disease (66%) say they usually talk with a friend, a spouse or partner, a family member, a co-worker, or a medical professional. The pattern is the same among e-patients who report no chronic disease.